Is organizing the garage on your spring cleaning to-do list? Or did you just pick up an arsenal of gardening equipment and you need somewhere to store it all? If that’s you, chances are you’re suddenly in the market for a storage shed. While you might be tempted to think that all sheds are basically the same, that’s not the case. Having a storage shed that fits your needs for size, style, accessories, and quality is the difference between using it for decades to come — and paying someone to haul it away next spring. Here are the 6 things to consider when buying a storage shed. From Mini Barns to Quaker Sheds in every imaginable material and color, you have literally hundreds of options. Finding your shed can be easier said than done — that’s why we’re here to help. Storage shed size is the most important thing, so it’s first on the list. The size of your new shed determines how much you can store, whether it’s heavy-duty lawn and snow equipment or boxes upon boxes of stuff. However, the bigger the shed is, the higher the price. That’s why we generally recommend homeowners buy a shed that’s more than large enough to accommodate their needs, but not so big that they’ll be paying for wasted space. 8 X 12 — Perfect to securely keep the boxes of things you can’t throw out. 10 X 16 — Ideal for storing a lawnmower, wheelbarrow, and other garden equipment, plus a few spare boxes. 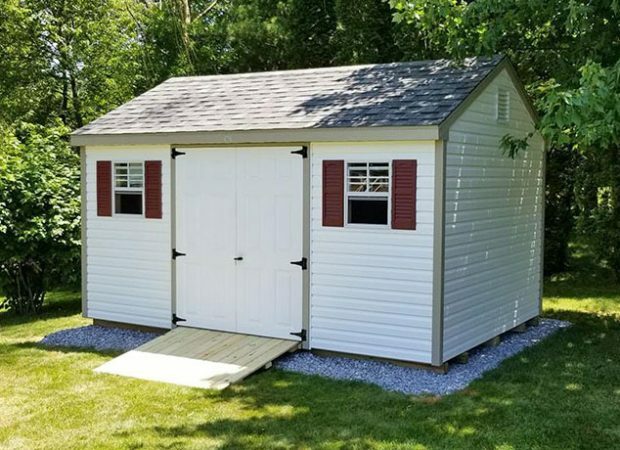 12 X 20 — This large shed is often used for storing a heavy-duty riding mower as well as everything else, too. Considering renting a storage unit? Compare that to a shed. A-Frame Shed — These sheds are the quintessential Amish shed design that so many homeowners love. In addition to that standout look, these sheds come at a budget-friendly price. High Wall Barns — This shed style gives you the benefit of more loft storage, perfect for those who have a ton of stuff. 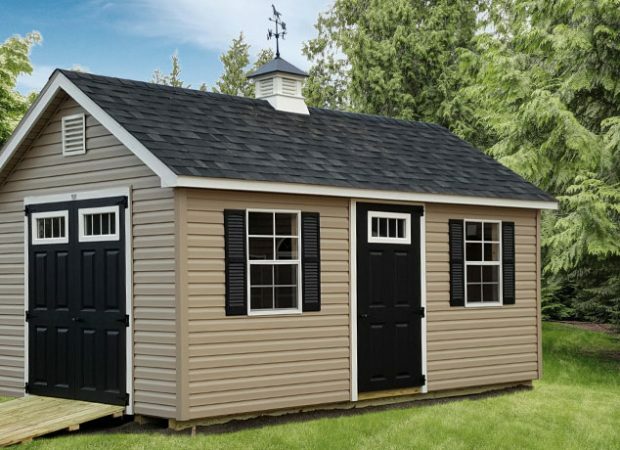 Plus, this popular shed also comes at a good price, too. Choosing the material of your shed is the #1 factor that determines its lifespan. Whether you’re still using the shed decades from now or it gets pitched three years after purchase, the material of your shed can truly make or break its longevity. Vinyl — What we build and sell because it’s the best. Our vinyl siding sheds are maintenance free and come with white fiberglass doors as a standard feature. Vinyl storage sheds have a 25 to 30 year life expectancy. Wood — Wooden sheds are a little cheaper than vinyl, but require regular maintenance. Plus, they can’t match vinyl’s lifespan because they are at a greater risk to rot. Metal — Metal sheds from big box stores are ultra-cheap, but highlight the lesson: you get what you pay for. Metal sheds aren’t secure and are often so cheap they rust out within the first year or two. Vinyl sheds vs metal sheds are no contest. A purely cosmetic choice, we offer a spectrum of shed colors to choose from. Some homeowners like to match their shed to their house siding color as closely as possible, while others prefer to go bold with a complementary color. 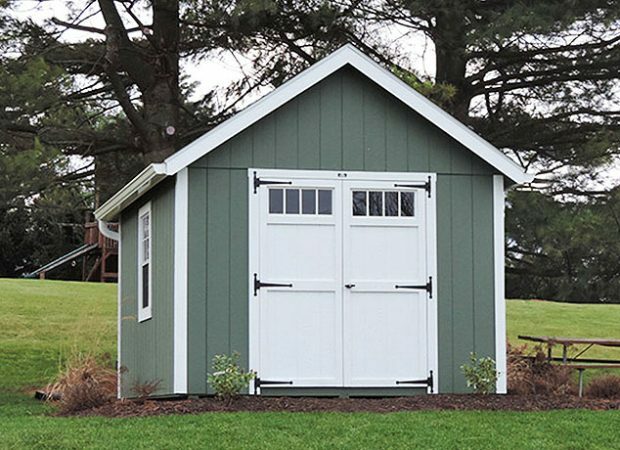 Some of our most popular vinyl shed colors are tan, clay, and white. Check out our shed color visualizer. Whether you need space for rakes, shovels, and a weed whacker or for your kids’ old BMX bikes, your storage needs are different from everybody else’s. That’s why the final decision you need to make is how you’re going to customize your shed. Gable vents, which help keep the shed cool in the summer. A ramp to make parking your mower in the shed even easier. A door seal protector, which protects the plywood door seal and frame from getting damaged by the weight of the mower. One other important thing to look for when picking out a storage shed this spring? An experienced shed builder. At Glick Woodworks, we have decades of experience building sturdy and stylish custom vinyl sheds. Want to get more details about our sheds? Or want your free shed quote? Pick Your Spring Shed Today! "The staff was very helpful. The guys that came to the job site did a fantastic job and made sure everything was cleaned up. I could not have been happier."